Are you feeling dis-empowered or perhaps even powerless or helpless? Do you blame others or situations for the challenges in your life? Or maybe you feel like a total misfit, completely isolated with no tribe or that you just don’t belong in this world. If you feel any of the above, you are not alone. I have felt this way many times in my life and most of the women who I have been blessed to coach, have felt like they don’t belong, have felt powerless and helpless at different times in their lives. I was blessed to recently have invested thousands of dollars & time, 6 weeks actually, diving deep into myself during Sacred Femininity Teacher Training with Tao Tantric Arts in Thailand. 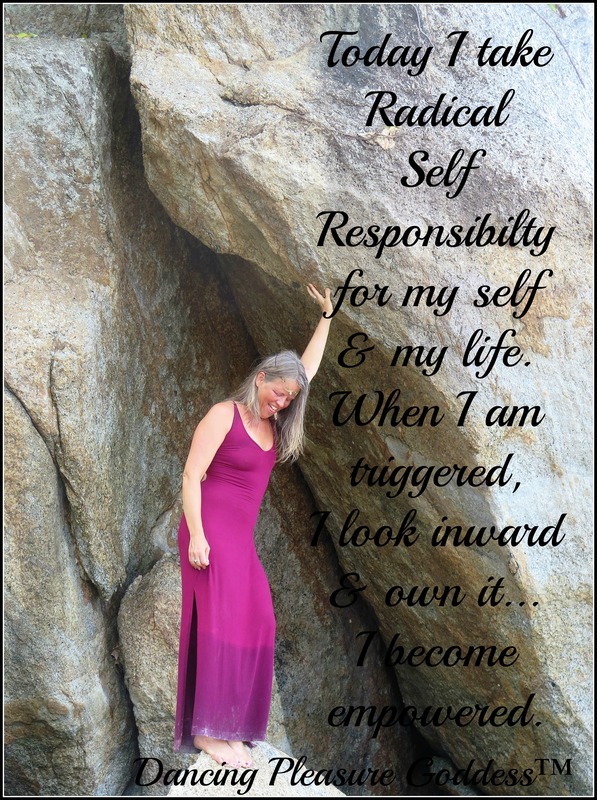 At the beginning of our training we were invited, no actually it was required of us ~ to take radical self responsibility for ourselves, including our upsets, our emotions, our hurts, our reactions, our projections, our triggers, etc. I want to insert here that this is a big request and it is not easy to do. It is huge! However the benefits far out weigh the challenges. This is the first and most necessary step to reclaiming our lives, transforming our entire lives and empowering ourselves. 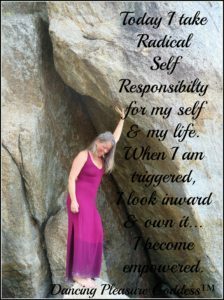 Accepting radical self responsibility meant I was letting go of being a victim or referring to myself as though I were a victim. That is powerful and terrifying at the same time. That meant no complaining about others or situations in my life. That meant no gossiping about another. That meant no blaming anyone, not even myself. So please stop and make sure you aren’t starting to blame yourself for the stress, conflict, drama, trauma, disease etc in your life. This is so important. Let’s not shift the blame from others to ourselves. In that moment I had no idea how this one decision would radically change my life for the better. I invite you to consider taking 100% responsibility for your entire life. I invite you to let go of ever being or referring to yourself as a victim. If something or someone frustrated, upset, angered, triggered or disturbed me, I just owned it as my projection, my reflection. No gossiping about another woman. That meant that if I was triggered by another, it was about me, not that person. The quicker I owned it, the quicker I shifted out of victim mood and created space for my own evolution, growth and eventual empowerment. A psychologist who I have worked with over the last couple of decades, told me that when we are triggered by another 10% is about the now & 90% of it is old stuff, old trauma from our past. So what exactly does it mean to take 100% responsibility for my life. Let me give you an example. Taking responsibility means that when I am triggered by another or a situation, I take the time to stop so that I am better able to respond which requires inwardness and pressing the pause button. This will avoid regrets and chaos caused by reacting out of fear or other emotions. If I am triggered by another, I take a moment to pause and look inward. I can ask myself, what is happening inside me right now? Who does she or he remind me of? When have I felt this way before? This process could take awhile. Answering these questions in your journal can deepen the process and help bring clarity. 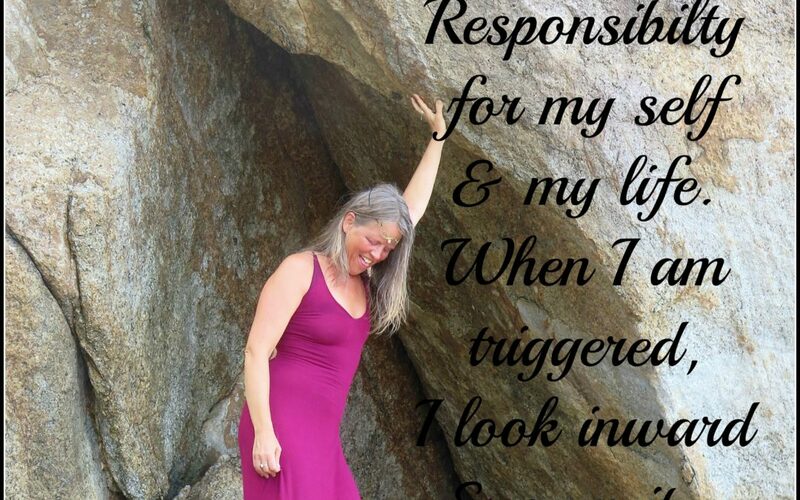 Once I am aware of what is being triggered inside of me, I have several possibilities. I could get help from someone to clear the past trauma. I could work on it myself if I have the tools to do so. Another possibility is that I can go and talk with the person who I was triggered by from a place of owning my emotional response. This can be very vulnerable to do as it can feel like we are exposing our wounds, faults or inadequacies. It also helps if you already have a loving relationship with the person you are wanting to talk with or that you are in a safe confidential container, space together. For example, there was one situation during the training where I was triggered by another woman who was telling me what to do. I was frustrated. I felt disconnected from this woman. I owned the trigger. I accepted that it was about me and had nothing to do with another. I realized that she totally reminded me of a family member who has criticized me and is often telling me what to do. With this family member in the past, I felt powerless and was unable to set boundaries. I spoke with this person and shared with her my struggle with my sister. I told her how I felt. As I shared, my tears flowed. This woman listened compassionately and I was able to shift the energy. After the charge of the energy was gone, I was then able to set a healthy boundary with this woman and ask her for what I needed. All of our e-motions are simply stuck energy. Energy and our e-motions, want to be energy in motion. We need to feel our emotions to free them. This allows stuck energy, stagnant chi to move. Once we have felt our emotions, it is important, to let them go. Let the energy move out of our bodies, where they were stuck causing stress and disease, and ask that they be returned to mother earth to be transformed to love. The reality is also that we can never change another person. The power to change lies within each of us individually. The great news is that if we can be responsible for ourselves, then there is hope and possibility of change. If it is my reflection that is there in this other one before me, then I can look at what I see with new eyes. If it is my projection, then I have the power to uncover any beliefs or stories that created that projection. If it is my projection, then I have the power to change it. I have the power to heal myself. Each of us has within us, the power to change. Each of us has within us, the seeds of self empowerment. We can reclaim our lives. We can empower ourselves. There are many interpretations of this quote. One of them says that when Jesus went to Nazareth, with his home community, they said that they wouldn’t believe a word that Jesus said until he took care of what ailed him. We can become empowered when we attend to our own faults instead of pointing out the faults or shortcomings of others. So instead of looking outward or elsewhere to what the world needs to heal, look within and heal yourself, ourselves. For me, that is how the world is going to heal, one person at a time, each of us healing ourselves. By healing ourselves, we empower others to do the same by through the example of our life. I am here. If you would like to receive coaching support, send me an email to vireo@dancingpleasuregoddess.ca and we can chat. It takes courage to reach out and ask for support. I have received the support of many mentors, personal life coaches, workshops, counselors and psychologists over the last several decades during moments in my life when I was struggling with relationships, experiencing parenting challenges, dealing with suicide of my brother, moving thru divorce after a 17 year marriage…. We all need support at different times in our lives. Send me a message if you would like to see if I am a fit for you and you are a fit for me. Also check out my upcoming events and check out my Women’s Retreat. I am also open to speaking at your women’s event or considering an invitation to customize a women’s event or couple’s event where you live.